One of the main motivations for people to download and stream TV-shows from unauthorized sources is availability. If fans can’t get a show through legal channels they often turn to pirated alternatives. However, the series finale of Breaking Bad shows that there are more factors at play. Despite the availability of legal options, in many countries there are those who still prefer to download a copy from unauthorized sources. Data gathered by TorrentFreak shows that 12 hours after the first copy of the episode appeared online, more than half a million people has grabbed a copy through one of many torrent sites. Never before have so many people downloaded a Breaking Bad episode, making it a strong contender for a top spot in our most-pirated TV-shows of the year chart. So where are all these pirates coming from, and why aren’t they going for the legal options? Based on a sample of more than 10,000 people who shared the site via a BitTorrent client, we see that Australia is once again in the lead with 18 percent of the total. This means that a large group of Aussies prefer to torrent the episode instead of watching it on the pay TV network Foxtel. In the U.S. and the U.K the legal availability on Netflix couldn’t prevent people from pirating the final Breaking Bad episode either. With 14.5 and 9.3 percent these countries are second and third respectively. India and Canada complete the top five with 5.7 and 5.1 percent of the total. Looking at the list of countries below it’s clear that piracy is still rampant, even in countries where people do have the option to watch the show legally. One of the explanations for this defiant behavior is that these downloaders simply prefer to torrent the show out of habit. As reported earlier, even among those who have a Netflix subscription, many prefer to grab a copy via torrent sites as they find it more convenient. In other cases people may find a pay TV subscription too expensive, or they simply prefer to watch the show at their own leisure instead of following rigid TV-schedules. Going back to the download figures, we can report that at the peak more than 85,000 people from all over the world were sharing a single copy of the Breaking bad finale via a public BitTorrent tracker. If we count the four most-shared copies out there this number totaled more than 190,000. While these are record numbers for Breaking Bad, Game of Thrones still takes the crown for the largest BitTorrent swarm ever recorded with more than 170,000 people sharing a single copy. Interestingly, TV-insiders are not really that outraged by the massive copying of their work. Instead, recent comments from people connected to the industry suggest that piracy may actually help them. Game of Thrones director David Petrarca previously said he believes that the buzz created by pirates eventually leads to more paying subscribers, and last week Time Warner CEO Jess Bewkes said that it’s better than winning an Emmy. 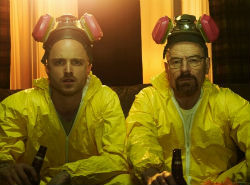 Breaking Bad already won an Emmy earlier this month, but can they raise the bar a little higher? We’ll know at the end of the year.